Watch the sun set below the horizon as you hover above Tampa Bay in a helicopter! Start your helicopter tour by flying over Davis Island and downtown Tampa before heading north to Busch Gardens, where you’ll spot wildlife roaming the park. After Busch Gardens, your pilot takes you south to the Alafia River, a place even more wildlife call home. Round out your sunset tour with an approach back to the glistening city of Tampa as the sun sets to the west. Whether you’re celebrating a romantic evening or looking for a fun night out in Tampa, this sunset helicopter tour will stay in your memory for years to come. Take off from Peter O. Knight Airport and fly over the mansions of Davis Island before hovering over the skyscrapers of downtown Tampa. From here, make your way north over Ybor City, a district of Tampa Bay named after a cigar manufacturer, to Busch Gardens! Your pilot will circle Busch Gardens, giving you a bird’s-eye view of the attractions and exotic wildlife. From Busch Gardens, head south toward the Alafia River as the sun sets, and admire a perfect view of the Tampa skyline. 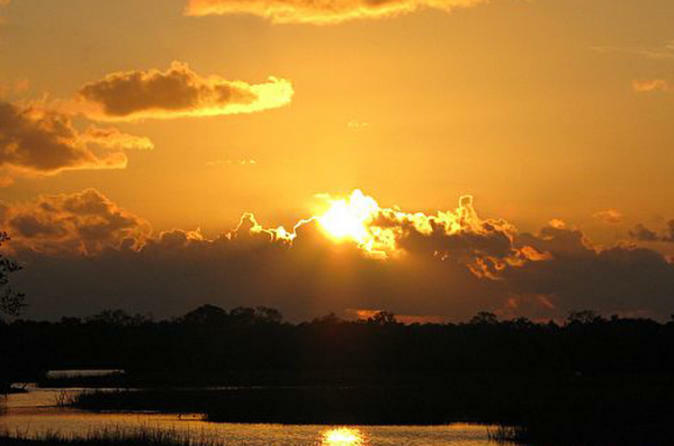 Once at the Alafia River, enjoy the serene environment at twilight and look for local wildlife. Then head back to the airport, enjoying the glow of the sunset.